The River fly fishing season is upon us! Well at least those of us in the Northern hemisphere. I’ve already seen a few large dark olives trickling down the stream a sure sign that spring is on the way. Those of us who have fished the long winter months are getting bugged off. Bugging for grayling does have its limitations and can get monotonous. Spring beckons and with it the chance to fish dry flies for rising fish using an imitation of the large dark olive Baetis rhodani. If you want to improve your catch rate in the early season it’s a good idea to walk your favourite stretches of river during the week before the start of the season at around 1 o’clock. Look out for the hatches of dark olives and the rising trout will not be far away. Pictured is the beast in question. It’s around a size 14-16. It is perfectly imitated by the onstream-guide match the hatch dry flies in sizes 14 and 16. For those of you who tie your own flies the materials to tie this fly are now available on the Onstream-guide website. The UV hares ear plus is a beautifully soft and easy to use dubbing material perfect for those nice tapered body effects. Tying the fly is simplicity itself. Add a few strands of CDC for a tail, dub on a small amount of the olive brown UV hares ear plus. Pair 2 CDC wings and fix them as shown and finally add a small dubbing of reddish brown UV hares ear plus. This is a simple but deadly early season fly. For Step by Step instructions exclusive to subscribers click here! Early season dry fly fishing is condition and time dependant. Mild dull and drizzly days are best and don’t arrive at the river before mid day. Providing a few large dark olives hatch then a few trout will rise. This is the domain of targeted dry fly fishing. 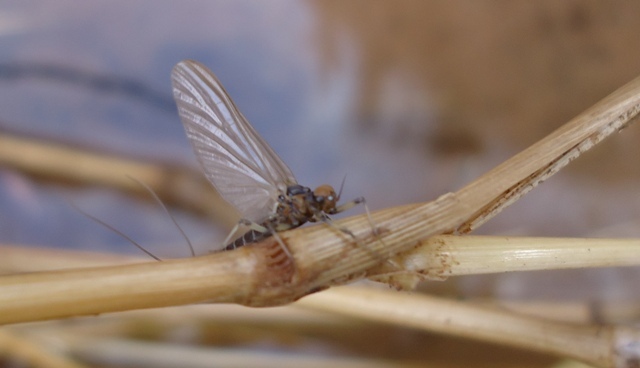 I use an Onstream-guide furled leader which gives fantastic dry fly presentation. 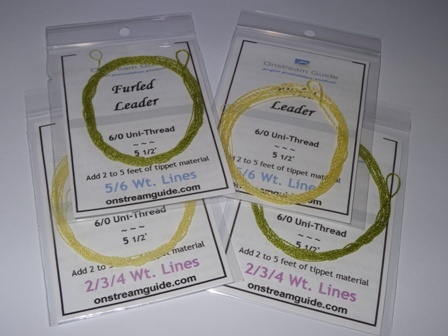 Furled leaders are often misunderstood. They are not braided leaders which can pick up water and become splashy. They are soft and weightless and play several important roles. The first of these is transferring energy from the cast through to the fly smoothly resulting in good turnover (with the exception of into a strong headwind). The second is inherent flexibility which means the furled leader can easily be collapsed (by slightly overpowering and then stopping the cast high) or manipulated (moving the rod tip during the delivery stroke). The upshot is drag free drift is far easier to achieve and drag free drifts result in fish! There are even more advantages in using a furled leader. It has a slight inherent stretch which acts as a shock absorber and protects those fine tippets. For more information click the picture below. Finally you can’t “line” a trout with a furled leader. When a fly line lands to close to a trout in clear water and we see the trout spook- usually it darts to a pre-determined “safe” place away from predators. It is not the sight of the line that spooked the fish. It is the weight of the fly line landing on the water which sends a pressure wave through the water detected by the trout’s lateral line. You can see these pressure waves when a fly line lands as sure as a pebble landing in a pond. This is why on small streams I use 2 and 3 weight fly lines and double taper. They are lighter and cause a much smaller pressure wave. A weight forward profile fly line will also cause a bigger shockwave (more weight towards the target) and will be more likely to spook fish. However a furled leader is weightless compared with a fly line and no rings emanate from it as it lands very gently. My early season dry fly set up is simplicity itself. A 3 weight progressive actioned rod, my favourite Sage Light Line 389 (3 weight 8 feet nine inches). My line is a DT Cortland sylk either 2 or 3 weight. To the end of this is the Onstream guide furled leader. I then add just 5 feet of 5x tippet (Orvis superstong or 4lb Ultima fly tippet). This is an exciting time of year with the whole season ahead of us. We wish you all a successful and happy time on your respective rivers. We hope to see you on the river soon.